Power Joker slot wants you to win its jackpot! 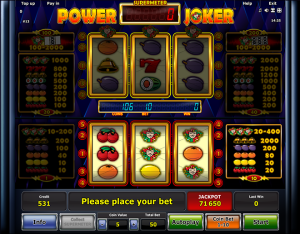 Power Joker is a quite popular and awesome slot machine and it's made by Novomatic. This colorful and fruity slot will help you achieving the best tasty prizes! Just get ready to count your winnings because it will seem like a neverending story! This entertaining game is the best option to make you feel better during the day. The Jolly Joker is a crazy guy but this time he is going to be your biggest companion. This fellon gives you the maximum line winnings and more mystery prizes than you can imagine. Don't be confused by those many tables, this slot machine is very easy to play. With its exciting gameplay you surely won't be bored at all! Your aim is to land 3 matching symbols on 5 win lines. The combination have to start from the left. Power Joker has special features which you probably haven't seen before. The juicy fruits are ready! The cherries, oranges, lemons, plums, melons are eager to get you the best winnings! Two other symbols can be found on the reels: bells and the Joker. There is a basic mode-you can play on the low set of reels. It is played on three reels. All the prizes can be checked on the right and left side of the reels. On the left there is the coin bet 1 table. On the right, you can see the coin bet 10 table. Cherries may be worth less than a plum but if you get the right combination, everything's possible with Power Joker slot machine. If you choose to play the table on the left, the winnings will be taken automatically. You will play 1 win line. When you determine to play by choosing the table on the right, you will be able to play 5 pay lines. The prizes below 2,000 coins can be bet again in the special Supermeter mode. So when you play the coin bet 10 and your winning is below 2,000 coins, this prize will go to the Supermeter. Did you know that you have the chance to obtain additional winnings in this mode? This mode gives you the opportunity to play the top reels and all symbols are worth even more! It can be played with 20, 40, 100 and 200 coin bet settings. The active coin value can't be modified in Supermeter mode. All winnings will move to the Supermeter except the Jackpot. This great feature will end when you can see 0, 2,000 or more winnings in the Supermeter. The Joker symbol will help you to get some delicious mystery winnings. These prizes are randomly selected and triggered. For all the combinations, check the Info section. 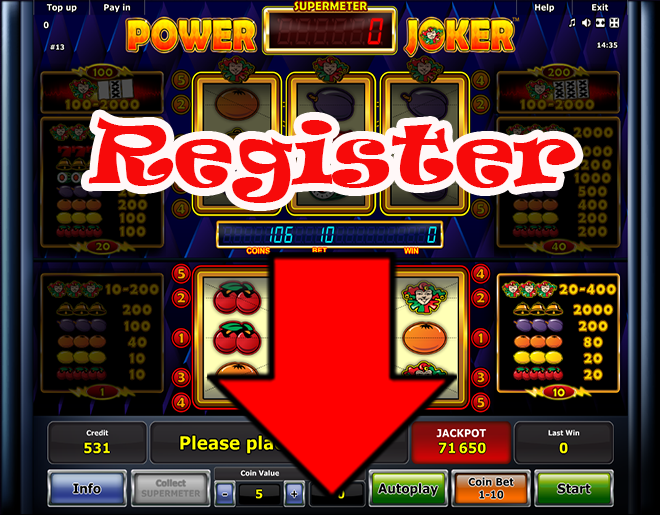 Last but not least, Power Joker online slot has a progressive Jackpot for all bets! If you place the maximum bet and hit the Jackpot, you will have the whole prize! Good luck playing with Power Joker and get the biggest winnings now! Go for the Jackpot! If you manage to hit the cool progressive Jackpot, don't forget to thank the Jolly Joker later!